What is The Martyrs’ Cross? It is the prayer tool pictured below. Production is actually currently paused and we’re not sure when we’ll begin again. But here’s the thing, we’re also a family, there are tens of thousands Martyrs’ crosses out in the world being WORN by both Christians living in hostile or restricted nations as well as ones with more freedom. 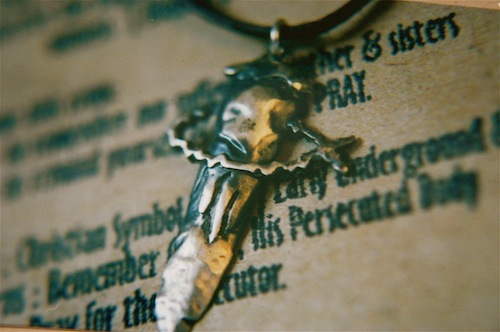 We are wearing it around our necks to pray for each other, especially to remember persecuted followers of Jesus, and their persecutors—around the world—in prayer and loving action. But if you don’t have one around your neck, you can still join us. Some people call it jewelry, and that’s alright, but to us—it’s more. To us, it’s a WAY. The Martyrs’ Cross is a message we wear around our hearts and minds. Worn in over 26 nations by believers in the God of Abraham, Isaac and Jacob who are giving up all to know Him, The Martyrs’ Cross is a symbol of remembrance and solidarity. Our message is clear: we will not forget, we will pray. And they are praying for us too. Join us in prayer every Sunday night by receiving an email with a prayer we can all join in. You can read it word for word or simply use it as a reminder and encouragement to pause and pray. We are pausing to place our eyes on the beauty and truth of God. We’re remember our family, we remember we are family, together. Join us and sign up for the weekly prayer companion, The Place Called Prayer, below— it’s completely free. Join The Martyrs’ Cross family. The Martyrs’ Cross is a family. We are a community of love and prayer. READ our blog and be encouraged, you’re not alone. What will you get out of subscribing to our site? The tools and writing we provide point to the Author and Finisher of our faith. We bring awareness and remembrance of those who are unjustly treated and persecuted for their faith, yet remain faithful. We bring courage and companionship to stay aware and prayerful. Often times the things that are most important to us can get lost in the fullness of our lives. It takes intention to make space for prayer. We want to come alongside you and help you make the priority of prayer a regular rhythm in your life.